Your saddle purchased from us is made from hand selected saddle skirting leather, chosen for its durability and extreme strength. However, any leather must receive regular care to preserve this strength and long life. At least four times each year your saddle should be completely cleaned with a good soap or detergent, and then well oiled with a good neatsfoot oil. In wetter climates, this should be followed more often, as continued moisture is very harmful to leather. With a program of reasonable care, your saddle should last for many years. The products we use to clean and oil our saddles are listed below. Do not store saddle in plastic or other non-porous covers. Allow a wet or damp saddle to air-dry naturally away from any other source of heat. Apply a little Bick 4 leather conditioner when the saddle is nearly dry to restore flexibility. Condition thoroughly with Bick 4 when the saddle is completely dried. 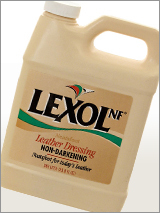 Do not use waxes, silicone or other leather preparations that impair the ability of the leather to "breathe". Dubbins and greases are bad as they seal the pores and are greasy, thus picking up additional dirt and dust and slows drying time. Never use caustic household chemicals to clean leather. Avoid leather preparations that contain alcohol, turpentine, or mineral spirits. We recommend Bick 1 as it is pH balanced to be compatible with leather. Do not use mink oil or other animal fats. They will darken leather. Animal fat can also turn rancid, causing the stitching and leather to rot.